Hello again! I hope everyone is having a great week. This bi-weekly development update contains a bit of information about the upgrade to Godot 3.0 and a few other new features that were recently added. Continue below for details and screenshots! The upgrade to Godot 3.0 continues to progress steadily. Most of the effort over these past couple of weeks has been around back-end code and less interesting UI work (aspects like the Model Properties panel and the dialog for adding new animations), so there aren’t as many cool, visual things to show this time. 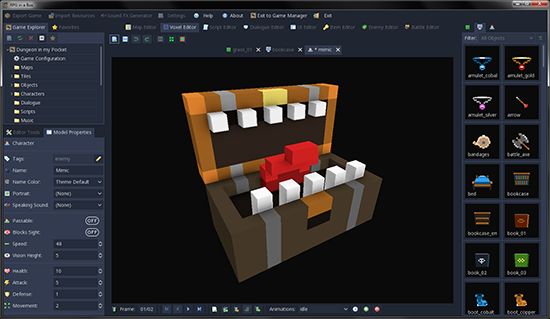 It is great, though, to see a lot of the Voxel Editor and related functionality finally coming together in the new version. I am loving the new UI theme of Godot 3.0 so far, I think it’s much cleaner and more modern than the current one. One feature that will be brand new to the Voxel Editor, and the animation system in general, is the support for reverse order animations. This allows you to specify a starting frame that is later in order than the ending frame. It will eliminate the need for redundant frames for certain types of models, like doors and gates that have multiple opening/closing frames in their animations. You can simply reverse the values for the starting frame and ending frame to achieve the opposite effect, like closing the gate as shown in the GIF below. The Music Library is now part of the new Asset Library feature that I’ve implemented. In addition to the chiptune music by Josh Penn-Pierson, there is now also a “Models” tab so you can easily import example content into your game project. I still have some improvements to make, but it includes a 3D preview that can be rotated to get a better view of the model. The currently release only includes assets from the official RPG in Box example content. However, Manoel Garcia (Voxel Minis) graciously offered to provide a set of sci-fi themed assets for inclusion in the Asset Library! I think including various sets like these will be a great way to help the community get started and provide inspiration/ideas for games, or even just as guides for modelling and animating their own assets. 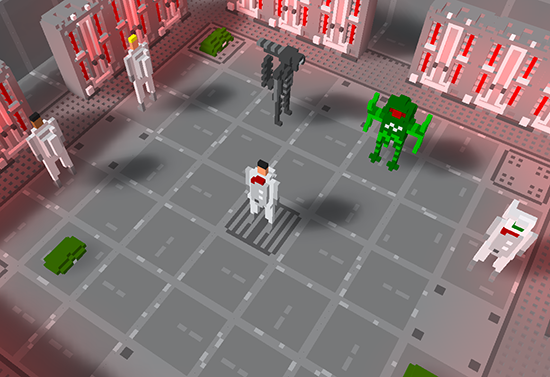 The sci-fi themed assets will become available in a release later this week. When setting up NPCs in a map, you are now able to configure a set of rules that will determine how the NPC behaves and interacts with the map. The original “Movement Area” property was moved to be included in this behavior ruleset. 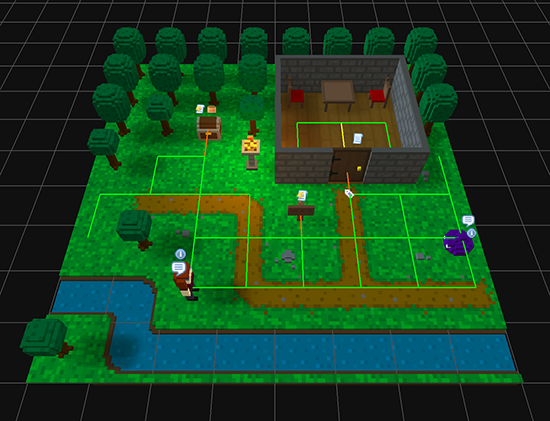 Currently, this feature supports several options for adjusting the NPCs movement area, movement direction, movement interval, and reaction to obstacles. The slime shown in the GIF below is set up to constantly move forward, but turn right when an obstacle is in its way. The small example game included with RPG in a Box was long overdue for an update, so I took some time to make various improvements and also bring it up to date to include some of the newer functionality. One final note, for anything interested: over the past couple of weeks I’ve started keeping track of my daily tasks at a more granular level, both for better transparency to the community and my own benefit. I thought it would be cool to share this information to make my work more visible to everyone, especially since sometimes there’s not much to show visually.